West Nyack, New York - RustyBrick, Inc. redesigned the front facing web site of NYFF Events to immediately showcase the level of detail that goes into the events NYFF Events manages. The home page sprinkles you with photography from past events, giving you a tease of NYFF's creativity into their projects. The new site is not just eye candy, it was designed to increase conversions, leads and marketing efforts. It is tightly integrated with their custom backend software, also designed by RustyBrick. The beauty and technology that is mingled together in this custom web site is truly an amazing coordinate effort between NYFF Events and RustyBrick. The web site takes on the latest responsive design techniques, ensuring the desktop, tablet or smartphone user can easily read and use the site. It is also incredibly search engine friendly and user friendly. Mabelyn Glanzman, Creative Director at RustyBrick, said "We wanted to give NYFF a facelift that matched the company's incredible ingenuity and event-planning creativity." "We did this by highlighting the client's amazing archive of photos and videos while making it very easy to navigate. Their previous site didn't fully showcase their capabilities or the blockbuster size of their events. The color photos pop against the classy black and white design - lending the site a lot of glitz and glamor - which is the key to NYFF-planned events." Check out the new web site today at NYFFEvents.com. 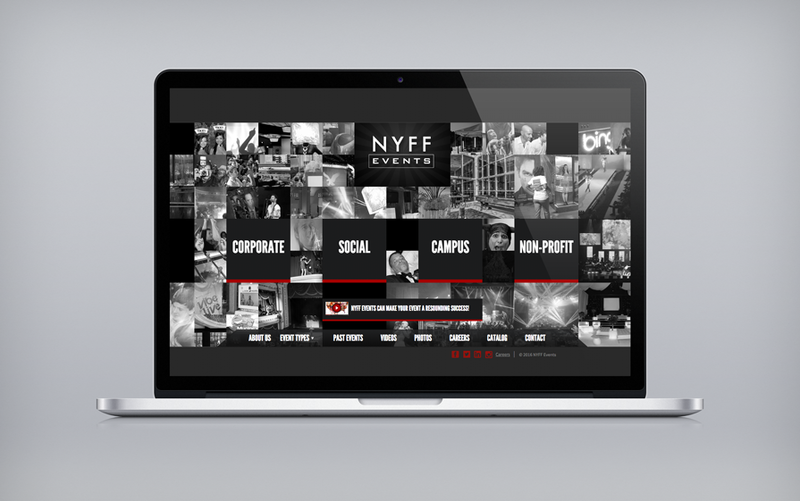 NYFF is a full service events company capable of planning and producing small, medium and large scale events. From tenting and staging to lighting, A/V and music & entertainment, NYFF does it all in-house controlling every aspect of production and guaranteeing its seamless and flawless execution. RustyBrick designs premier iPhone & mobile applications for the Jewish market. They also work with clients such as MTV, Harper HarperCollins, Comedy Central, Harvard University and many more. RustyBrick also designed the most popular Siddur for the iPhone at http://rustybrick.com/siddur and has some of the most popular Jewish apps at http://rustybrick.com/iphone & http://rustybrick.com/android.